Early this morning, our football team had a workout and a barbecue on Crandon Park Beach to conclude our summer conditioning program under the supervision of our strength and conditioning staff. Following the workout, some of our athletes went to rinse off at a designated public shower area and a few of them made a poor decision and changed their clothes in public. 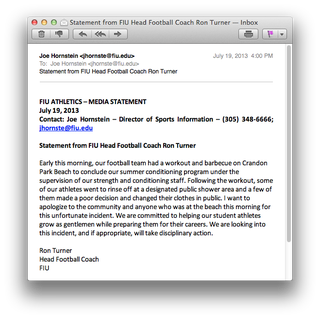 I want to apologize to the community and anyone who was at the beach this morning for this unfortunate incident. We are committed to helping our student athletes grow as gentleman while preparing them for their careers. We are looking into this incident, and if appropriate, will take disciplinary action.